Anytime until the age of twenty, the Board can activate you and if they do, you'll have thirty days to find and kill your Alt. To hunt down and kill (or be killed) by someone who looks exactly like you. Only after one Alt has been killed can the other be considered a complete, someone considered worthy to live within Kresh. Failure to find and kill your Alt will lead to both of you dying at the end of the allotted thirty days. West Grayer is fifteen when she goes from idle to active and then it's a race to see who will kill who first. Only, West doesn't go after her Alt immediately--even though she knows that she should. After all, she's doubting herself and her worthiness to be completed. What if her Alt is actually the better of the two of them? In that sense, Dualed is very much the story of how West fights with this and the decision she ultimately makes. There's also Chord, a boy who is friends with her brother, Luc; he intends to protect West as best he can--without overstepping--even if she doesn't want his help. I really wish we'd gotten more of him in Dualed and I think this stems from the fact that I'm still feeling a little detached from him. But if we're playing favorites here, I think I liked Baer and Dess the most. Baer is a weapons instructor and Dess is another active--who is younger than West--who she runs into while West is avoiding her Alt. I honestly would've liked to see more of the secondary characters in Dualed, but I'm hoping that we'll see more of them in the next book! Also, while I really do love the plot and the world that Elsie Chapman has built, I feel like I needed more plot seeds for the next book--if that makes sense. While I really enjoyed Dualed's plot, I feel like I have no idea what the next book will bring. 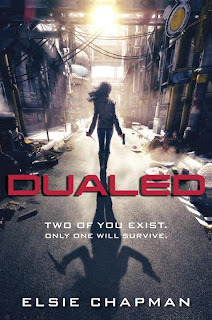 On one hand, I really love that Dualed has a concrete ending, but on the other hand I wish I'd gotten at least a little hint of what to expect in the next book. Will we be seeing more strikers? More of the Board? Will we get to see what lies beyond Kresh? I am a sea of questions! Having said all of that, I really did enjoy Dualed and if you've been thinking about reading it, I'd definitely encourage you to give it a go! Why should you read Dualed? It's fast paced and packed full of action! Seriously though, I think this one is definitely worth giving a go. Your review makes me want to pick this up more than ever. I was a little worries about the 'first in a series' thing, because I have series fatigue in a big way, but it sounds as though it can be read as a standalone. LOVE that. Thanks for sharing! Dualed has been on my to-read list since I spotted the cool cover, and I'm glad to hear the story is great, too! It really sounds exciting and action-packed, but I'm glad to hear there is a good emotional inner battle Alt deals with too. Now I can't wait to start this one! After your review, I am am looking forward to this even more. Awesome review. Thanks for sharing you thoughts. I just bought this book the other day and am so excited to read it! I'm also really happy that it can be a stand alone book, because (for now!) I don't feel like having to wait for the second book while churning over a crazy cliff-hanger! I would love it if you could check out my blog!